Magic is what fifteen-year-old Shane Harrison needs to solve the tough problem he’s facing. Lucky for him that my short story “Turquoise Trail” takes place in New Mexico, a magical landscape where wishes really can come true. 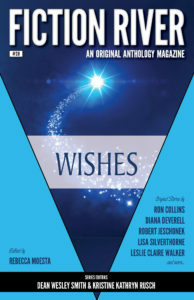 You’ll find Shane’s story and fifteen other tales of teens trying to wish away their problems in Fiction River: Wishes, an anthology that promises to lift your spirits and remind you just how much magic the universe offers. Digital edition available from most ebook vendors. Coming soon in paperback from Amazon.